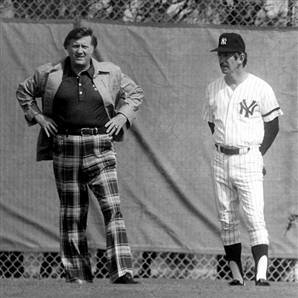 George Steinbrenner did amazing things for baseball. He created an empire (the "Evil" part came later) that grew beyond anything he could have possibly dreamed and became the envy of many teams around the league. This of course involved a horsesh*t load of money being thrown every which way and the constant hirings and firings of every single member of the Yankees Organization at some point. The firings are amusing to hear about to this day, but it's the money thing that really had a lasting impact on the league. Was he alone responsible for the rise in contracts to the insane amount they are at now? For the destruction of the hopes and dreams of the small market baseball team? Eh, maybe. Dude was a Yankee, he was capable of anything. Not sure if you ever caught my take on Big Stein. And yes, I'm still working on that mustache. He definitely added another level to the rivalry, and then all his comments about the new ownership group when they were trying to get under his skin pumped it up even more. He definitely propelled those few seasons (2002-2007 mainly) into some incredibly heated games/series/seasons. If he didn't pay someone millions and millions of dollars to play, someone else would have, it was just a matter of time.